DVD can be used for both entertainment and advertisement. If you are fond of a clip from a Old Family DVD movie and want to add it to Movie Maker for Publish into CD but have no idea about how-to. Now just follow this article to finish the conversion while reserving the original video quality. In order to import DVD to Movie Maker for editing, you need to convert DVD to Movie Maker compatible format (such as MPEG-4) first, and then import into Movie Maker to edit and “publish” them to CDs. In fact, with the right program, you can get all done easily and quickly. Here, Pavtube Video Converter Ultimate can help you with the easiest way to convert old family movies to MPEG-4. Besides, you can also rip Blu-ray discs And other video files to any format as you want. For Mac users, you can use Pavtube iMedia Converter for Mac. However, The solution is easy to think, but to practice it. As below you can rip DVD with 3 steps and then you can easily get the MPEG-4 files for Movie Maker editing and publishing into CD. Do not miss: Please read Top 5 Best Video Converter Ultimate Program Review if you are running on Windows 8.1. Free download and launch this DVD to MPEG-4 Converter, and then insert your DVD disc to the DVD drive. Click “Add Video” button to load DVD movies to the program. It supports batch conversion, you can import and transcode multiple movies files at one time. Step 2. Choose MPEG-4 as output format. Choose “HD Video–>MPEG-4 HD Video(*.mp4)” on the drop-down menu as output format which is still suitable for editing, playing and making into DVD. You can also backup DVD on iPhone 6, NAS server, Roku 3, Nexus 8 and so on. Hit “Convert” button to carry out the conversion process. Once the conversion is done, you can click “Open” button to get the output files. Then, you can import the converted video files into your Windows Movie Maker and make into CDs by clicking “Publish”. What’s more? You can watch the ripped movies (that have been edited) on TV sets and computers and even smartphones. 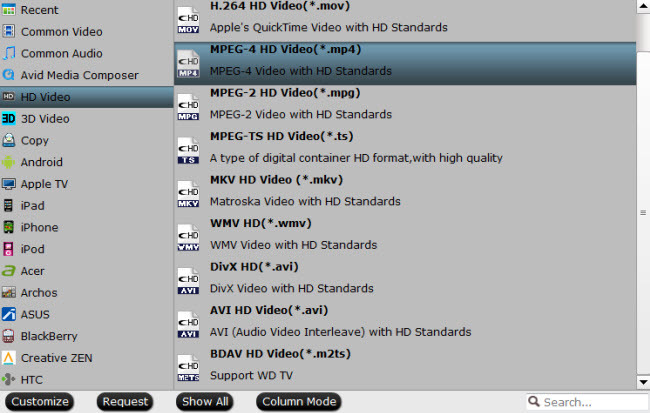 I think this article give you the best solution about rip old family movies to MPEG-4 and publish into CD, all right? Happy experimenting!